All day tour of remnants of Gila River Internment Camp (Gila River, AZ – south of Phoenix) & memorial. Reservations REQUIRED. Contact DirectorRoss Iwamoto at sajcc@yahoo.com for information. This was one of the large Japanese American internment camps caused by E.O. 9066 during WWII. Over 13,000 Japanese Americans, 2/3 of whom were U.S. Citizens were interned here from 1942 to 1945. Tour date: Saturday, January 24, 9 a.m. to 3 p.m. $10 for lunch or option to bring our own. We will be car pooling to this tour site from Tucson and Phoenix. 17 of us from Southern AZ Japanese Cultural Coalition & friends participated in this tour today of the remnants (concrete slabs, some stone steps, building mounts, abandoned koi ponds) of the Gila River Internment Camp, plus a white stone memorial built by the Gila River Indian Tribe on the hill overlooking the camp in 1995. One person on the tour had a mother and sister at Gila River camp, plus others had family members interned at Heart Mt., Wyoming, Jerome and Rohwer, Arkansas. Others like my father had been forced to flee Los Angeles before the camps came to be. We honored those today who had been innocently interned during WWII, lest we forget them. Who do you contact to schedule a field trip. 6th grade class learning about Japanese internment and would like them to see the real camps. Contact Director of SAJCC, Ross Iwamoto at sajcc@yahoo.com. He has the contact info for the Gila River Tribe but I don’t know if they do public tours. Soon after the war, the government sold and/or relocated many of the buildings from the Gila River internment camp. I went to an elementary school in Casa Grande that had bought many of those buildings, and some years later, my parents bought one of them, and had it relocated on their land out in the desert. I grew up in what was once a Gila River internment barracks. I have many fond childhood memories of that home….but I am also aware that there are many former inhabitants who do not share my fondness of that building. It remains in my family to this day (my sister lives there now). Except for the porches added to it, the old building pretty much looks the same as it did when it was at Gila River. 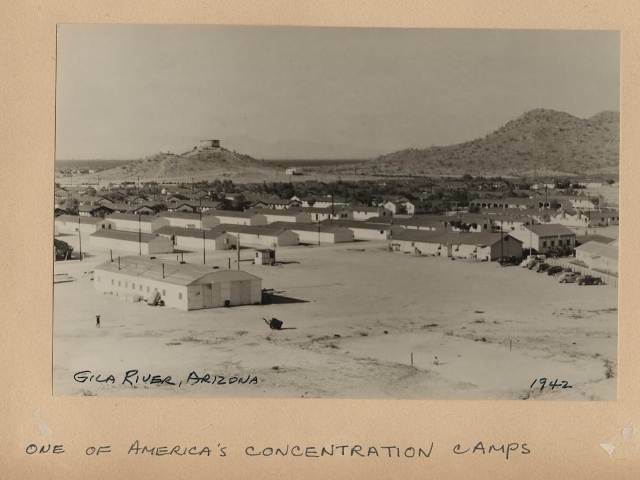 Thanks for commenting Bob — yes, the former Gila River internees do not have fond memories of their stay there in that camp. Several live here in Tucson, but I appreciate you writing to us about your unique memories. Sorry for the late response, I didn’t see your message till recently. Contact Prof. Karen Leong at Arizona State University, karen.leong@asu.edu as she sent us that photo. Thanks for writing and good luck w/ the Day of Remembrance story. My parents, maternal grandparents, and my mother’s siblings and their families were interned at Gila. I wish I would have known that you were conducting the tour. We do not live in AZ. Are there plans for any other tours? No, we do not have any plans for a return visit, but visit the JACL Aizona website (Glendale, AZ) as they have yearly clean ups of the memorial on the butte next to the campsite. I have photos of the Gila River camp including a group photo of about 100 of the residents just before the camp closed. Anyone interested in them? Ray, sorry for the late reply. I don’t get these emails directly to my address. Send email to Donna Cheung at JACL re: these photos. Her email is dcheung2721@gmail.com. JACL is the Japanese American Citizens League, Arizona chapter in Glendale, AZ. The Japanese American National Museum in Los Angeles, CA collects such information and often asks for anyone having such historical documents as you mention to send them to the Museum. This may be a long shot but I was wondering if there was any way to visit the camp? My uncle was sent there during the war and I would love to see what he saw when he lived there. Please note under Upcoming Events on our website that there will be clean up of the memorial and remembrance at the Gila River Internment Camp on Nov. 3rd. Contact JACL Pres. Donna Cheung ifyou are interested in helping. Her email is on the event flyer. The next clean up at the Gila River memorial is scheduled for March 30, 2019. Contact JACL President Donna Cheung at dcheung2721@gmail.com for more info.